Reminiscence Patchouli Pour Homme is not a strange, cocoa-sprinkled, cramp-inducing patchouli fragrance like Serge Lutens Borneo 1834 (whenever I smell Borneo 1834 my stomach begins to ache). Patchouli Pour Homme is certainly not a loud, “crude” type of patchouli perfume favored by provincial nouveaux riches. (See Chekhov’s The Cherry Orchard, where the prissy, aristocratic Leonid Andreyevitch Gaev enters a room, sniffs the air, and complains: “It smells of patchouli in here.” Someone’s wearing cheap perfume…and it’s none other than peasant-turned-entrepreneur Ermolai Alexeyevitch Lopakhin!) Patchouli Pour Homme is also not the variety of oily, overbearing patchouli used by old-time hippies to scent their greasy hair and beards or their sweaty leather boots. Patchouli Pour Homme is a staid patchouli fragrance. Reminiscence Patchouli Pour Homme contains mandarin, lime, geranium, cedar, patchouli, labdanum, tonka bean, tolu balm, white musk, and benzoin. Patchouli Pour Homme opens with warm lime and geranium leaf; quickly other notes pop: ‘fossilized’ cedar (almost too “dry” to detect), sheer labdanum, well-behaved and CLEAN patchouli. As the fragrance settles, patchouli remains and is joined by light musk, and the vanillic aromas of tonka bean and benzoin. Patchouli Pour Homme is nice enough, but it needs “a little something” to snap it out of its dull stance. Last weekend, I visited a pretty little seaside town just a few hours from Seattle. I was surprised at how the people living in that beautiful spot seemed afraid to SMILE. An adorable (presumed "local") Labrador Retriever acted startled (in a good way) when I grinned at him. Everywhere I looked there were glum faces, slouched shoulders, uncombed hair and rumpled clothes. These people even moved gingerly. I listened and looked in vain for a humorous, even wickedly funny, woman — a woman who walked with a spring in her step. The adult men I saw were almost expressionless — perhaps their too-tight ponytails were hampering facial movements; the young men couldn’t see much at all with their ubiquitous, eye-obscuring Justin Bieber haircuts. Anyway, what those dour citizens needed was a shot of something (alcoholic or medicinal) to jolt them out of their zombie haze. To be fair, maybe they needed a few days of sunshine...this IS Washington state and we’re having a cool-ish summer so far. * Patchouli Pour Homme could also benefit from a “shot” of, say, heavy-duty lime in its opening, or a dash of tuberose or violet in its heart, or some dirt in its smooth-as-silk, soft-as-face-powder base. As it stands, Patchouli Pour Homme is serviceable, predictable…ho-hum. 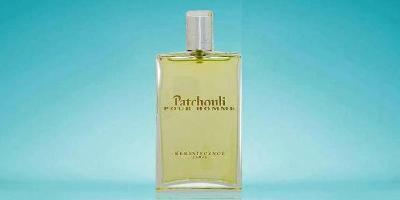 Reminiscence Patchouli Pour Homme is $95 for 100 ml of Eau de Toilette. For buying information, see the listing for Reminiscence under Perfume Houses. * And, no, I will not name the town; I don’t need any more enemies. My beloved Borneo a “strange, cocoa-sprinkled, cramp-inducing patchouli fragrance”? Oh, Kevin… you hurt Borneo’s feelings. Miss K: you are! HA! Maybe they are all pretending to be dour hippie sun hating vampires? Anns: it’s not easy being a vampire this time of year in the NW, when the sun’s out, it’s out till 9:30ish p.m.! So that’s why they are so grumpy! Too much daylight in one of the most gorgeous places in the US! … I had the same experience when I lived in PDX – grumpy people. I’ve lived all over the country and also in some truly depressed Rust Belt towns in the NE. IMHO, a lot of people who live in the NW forget how lovely and fun that part of the country is. Even my husband who is a native Portlander and now lives over here in boring old PA with me says he took it all for granted. misskitty, my first thought was “if he wanted characters, Kevin should have gone to Long Beach – or Seaside.” Of course, I hear that Forks is filled with characters (snicker). Borneo doesn’t like me, either Kevin. It should but it doesn’t. Have you tried the PdN Patchouli? How would you compare that to Reminiscence? I was thinking Ocean Shores is pretty depressing, but I seriously doubt they have a Thai restaurant there. And it’s not within two hours of Seattle. Even though no one asked for recommendations, Ruby Beach in Washington is great. Lovely and remote, and Kalaloch Lodge has the best hot chocolate in the world. Miss K: thanks, I’ve never been to Ruby Beach! Oh, you should! And you can go hiking in the Hoh! Omg! Miss Kitty, trust it to be you to recommend what I call “my favorite place on earth. I love Ruby Beach! In fact, I have a pic of it as my screensaver right now. lol And I’ve been to Hawaii, the Bahamas, the French Riviera…and this is *still* not only my favorite beach, but my favorite place. We just happened to stumble across it while driving up and down the coast one summer. There is just something – ok, this is going to sound so corny, but it’s kinda mystical. Like some laylines must cross right over it. LaMaroc: that does it…I’m going this weekend. Aparatchick: well, I smelled and then gave away my sample of PdN immediately…this is going on MEMORY…but it had a more feminine vibe to me…but still soft and sweet. Dont they have a patchouli homme now? Or is it patchouli intense? Rictor: yes, Patchouli Homme in Les Magnifiques collection. I think it’s been renamed Patchouli Intense, but it’s the same frag. Aparatchick: I love the BEACH at Long Beach…walking for miles and miles with surf crashing. But I had my worst Thai meal in the WORLD there…memorable for its vileness! Slowly compiling clues… Unsmiling people… seaside town… Thai restaurant… Oh, I’ll figure this one out yet. Miss K: curious to see if you WILL figure it out. It’s not going to be as easy as I originally thought. I really thought looking at a map would help me zero in, but so far not so much. But thanks to the words “seaside town” I now have Every Day is Like Sunday stuck in my head. Which actually fits your description of said town. So there you go. I didn’t find the town, but I found Morrissey. Oh come, Armageddon. Come, Armegeddon, come! You guys are cracking me up! So, this town is the U.S. West Coast equivalent of Blackpool, UK? (I think that’s where the “Sunday” video was filmed – not sure if that’s the town Morrisey was referring to). This is driving me crazy too. Ok, how about Moclips? But I guess that technically is Long Beach. Fork shouldn’t be depressed, their tourist industry is booming, now, thanks to Stephanie Meyer, RPatz and KStew. That’s it, I’m breaking out Google Earth. But speaking of Seattle, I’m going there soon for a few days. Where’s the best perfume shopping? Suddenly: the best shopping is in downtown Seattle: Nordstrom, Barneys New York (side by side) and Parfumerie Nasreen on 1st Ave. in the Alexis Hotel lobby. Also, if you are in Bellevue, there’s Neiman Marcus. Have fun…the weather is improving. And do visit the great gardens here: full of smells: the Arboretum and Kubota Gardens, especially. Kevin, it’s been awhile since I’ve been back, but is there still a little fragrance boutique in Fremont? I believe it’s still there since I think my friend Joel just bought some Diptyque fragrances there fairly recently. Even though it’s supposed to be a little hippy mecca, Fremont has some great shops, and not just of the crunchy granola variety. LaMaroc: there is a little shop in Fremont…Essenza. They DO carry the Serge Lutens line, Diptyque, Carthusia, Fresh, a nice Hawaiian line, some Estebans, the Ineke line…. They stock all L’Artisans, but must not do a thriving business in them since the stock is almost all in OLD-style bottles…how many years after the redesign? That’s the one! Yes, I do remember Joel mentioning that when he bought his bottle (I believe it was Virgilio?) they threw in the 1/2 full tester for free. He said the integrity of both seemed to be intact. Hmmm, maybe if they decide to have a sale, and can ship, I may just have to help them unload some of that old-design stock! The two stores I remember from my one trip to Seattle are Lark in the Morning (traditional musical instruments) and John Fluevog (strange and wonderful shoes). I really like the original Reminiscence Patchouli for women – soft, pretty and wearble. Not too funky, but not too denuded either. Anns: Robin reviewed one that sounded great too: the “Elixir Patchouli” but I”ve never smelled the others. Obviously that screenwriter hadn’t heard of Coromandel, or it wasn’t launched yet. There’s a form of patchouli for *everyone*! promise/Joe: was about to say the same thing about Coromandel…most consider it Patchouli. period. I always assumed I hated patchouli outright b/c I thought it only smelled like the head shop variety. Boy was I ever wrong. A predonimant amount of my favorite winter orientals have fragrant perfumey patchouli in the base. And, I don’t care for the denuded patchouli that shows up these days – not enough character. I love patchouli!!! Hello Noir Epices, Bal a Versailles, Coromandel, Rem, Patch, Mauboussin, Maroc pour Elle et. al. !! For some reason, when you described that town, i thought of the michelin tire commercial with the “sad stretch of road” where all the animals are glum because so many of their friends are roadkill. Anyway, as far as patchouli goes, its never really been a note that suited me, but i do like Etro’s version and UL Nightscape. Rictor: thankfully didn’t see any roadkill…. I do like the Etro Patchouly but it always goes BAD in the bottle on me…so I stopped getting it. “Cramp-inducing”??! What is that even supposed to mean, Kevin? Borneo certainly isn’t sweet or candied. Anyway, to each his own; Borneo happens to be, in my opinion, the greatest patchouli scent on the face of this earth — such that I’m not really on a quest for others. The Reminiscence sounded good at first, but later in your review I realized that it probably doesn’t warrant a test. How about the Nicolai patchouli? I’ve been a bit curious about that one. Joe: Cramp Inducing means my stomach aches and heaves when I smell, and especially, WEAR Borneo. It’s the perfume equivalent of putting heavy cream, lemon juice, Pepsi and spicy tomato sauce in a blender and making me drink it. The “blend” just doesn’t work for me…sorry to say. My mother wore Ciara when I was in Jr high school, and it gave me the worst heart burn I have ever had. I never wore it, mind you, but I’d get this awful heartburn when she did. Took awhile to figure out what was causing it. There’s just no telling how things will affect people. JolieFleurs! HA! Forgot all about Ciara! As a patchouli lover, I tried the PdN and wondered where the heck the patchouli was. I think what she’s done is create the effect of patchouli by using different notes- I think luckyscent doesn’t even list patchouli in the notes. If I understand correctly, it’s like how Nahema doesn’t contain any rose but is one of the best roses ever. However, I won’t say PdN’s is the greatest, but very clever work. It also lasts for days and days. Jared: those PdN have great lasting power! Agreed Joe! I love Borneo! I have a sample of this and I have not smelled it yet. I have smelled Patchouli Elixir by Reminiscence – very dirt prominent…spooky stuff. Have you smelled this one Kevin? Still, I’ll stick with the cramp inducing Borneo 1834 any day. Although Nightscape by Ulrich Lang recently got my attention, big time. Mike: haven’t tried Elixir…but the descriptions sound good to me, more “my thing” than PPH. “strange, cocoa-sprinkled, cramp-inducing patchouli fragrance like Serge Lutens Borneo 1834″???? Like Joe and Miss K I’m firmly in the Borneo camp! Why settle for a ho hum patch when I can wear ” the greatest patchouli scent on the face of this earth” (couldn’t have said it better). Thanna: you all ENJOY then…whilst I run for some Pepto-Bismol! I LOVE Borneo. Rem Patch Elixir great also. Although I own the PdN, don’t love that one all that much. Montale Patchouli Leaves and Bois 1920 Real Patchouly are other excellent juices. You can safely that Patch is one of my FAV notes. C: I was waiting for you to chime in…agree on the Bois 1920! Sorry it took me so long. Was at the beach! C: a great place to be…hope you had a shaved ice cone for me…tamarind flavor por favor. The Montale sounds like something I need to try. I’ve seen it mentioned several times recently and always favorably. Kevin – thankfully you are Anti-Lem (not to be confused with Auntie Em)! That’s a good thing though! And on the patchouli front, a recent one that I’ve tried and really, really like is Nobile’s Patchouli Nobile. Highly recommended. *snort* Anti-Lem, I love it! I think you’ve just coined a new frag term! I love PG Coze, but must admit I that I hesitate to wear it out anywhere, unless the occasion calls for a protective forcefield (e.g., first trip to the supermarket after the January blizzards, aka Snowmaggedon). Now I’m really curious about the PdN Patchouli. I love what she did with lavender in Nicolai pour Homme. nozknoz: there’s not a PdN in my perfume collection, but I still have about half left to try. I tried Elixir and Eau de Patchouli and neither impressed me–well actually one of the 2 (???) did: I couldn’t wait to get the scent off my wrist. So I’ll just take your word for this one and pass it up. Will save me some precious shopping time. plat: always good to shorten “The List”, isn’t it? Hi Kevin, by far the best patchouli I’ve smelled recently is Parfums de Nicolai’s creation, the also named Patchouli Homme. It’s absolutely superb and needs nothing else. It’s a really interesting and beautiful take on Vetiver, far more preferable to the rubbery Grey Vetiver by Tom Ford. One more cheer for PdN Patchouli Homme! Much drier than Coromandel. I adore it and oddly enough it gets more compliments than any other frag I’ve worn in ages. No one guesses that it is patchouli. They just love it.